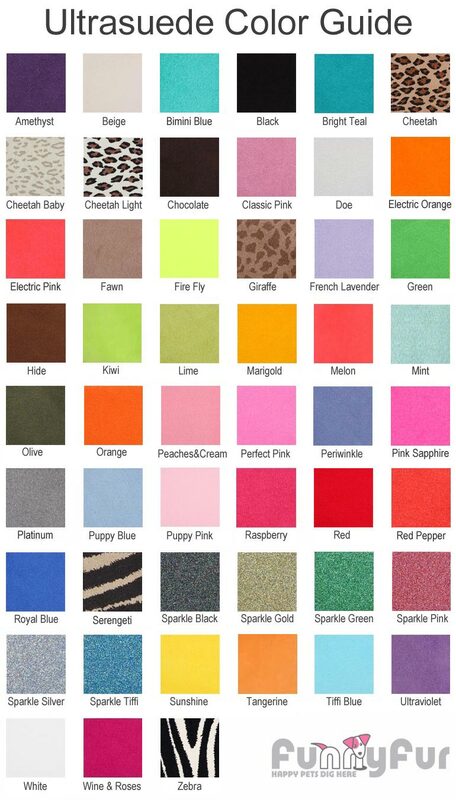 These Ultrasuede hair bows by Susan Lanci feature 3 tiny crystals and come in your choice of 50+ beautiful colors. Barrette backing. Before initial wear, it is highly recommended that you treat your Ultrasuede with a quality water and stain repellent product. We offer stain guard service with Vectra 16 Protectant for $1 which repels tough stains while keeping the Ultrasuede soft and luxurious. Regular stain repellent treatment is recommended to keep your Susan Lanci Ultrasuede products looking their best. Apply product initially and every two to three months with regular wear. Re-treat as necessary. Our stain guard service fee is non-refundable. These bows are perfect for my little Yorkie. They grip his hair nicely and don't slide out. The bows are classy and look so cute with the little gems in the middle of the bow. See actual PHOTOS! I already wrote a review below but then I got to thinking...I personally like to see what a product looks like in"real time" before I buy it. So, if y'all are interested & want to see the actual photos based off my reviews you can. Go check out all our Funny Fur purchases and more along with 15,000 of our awesome followers on Instagram! We really love our Instagram fur-friends & family and don't mind a bit if y'all stop on by. *I'm a disabled veteran and proud to have served in the US Air force. I hated my disability for a long time, hid, ashamed to be in public, but having my dog has really saved my life. Our 3 core values while i served were: "Integerity First," "Service Before Self" & "Excellence In All We Do". I still hold true to those values. I just love my little yorkie, Aurora so much. I write the reviews because of her. She's my world now & just want to help others out of the blessings she brings if I'm able. I just adore this bow! The "TC" size is perfect for my 2.5lb Yorkie, Aurora. Susan Lanci really does have some of the cutest bows on the market. They are priced a little high for one bow but it's a reflection on the quality of this product. I'm very happy with my purchase and so is Aurora. Click the button below to add the Susan Lanci Plain Ultrasuede Hair Bows to your wish list.